I spent my whole childhood packing around bunnies and chickens…dressing them up and pretending they were my babies…so this fabric was irresistibly cute. 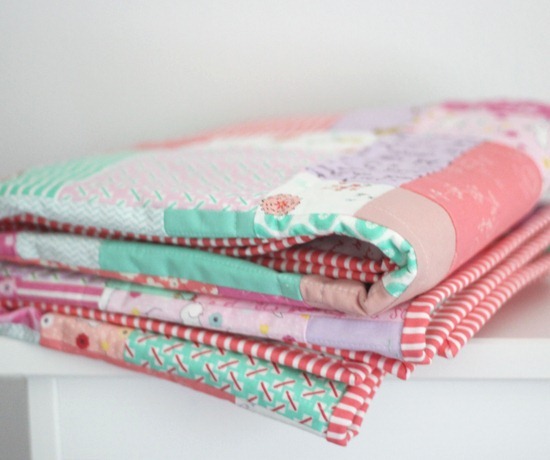 When you see the pinks alone they look like they would clash…but when they are together in the quilt they work perfectly. I made this quilt with 2 charm packs of Posy by Aneela Hoey for Moda, 3 coordinating solids (Tea Rose, Green, and Bunny Hill Pink Bella Solids) and a Riley Blake Green Herringbone that matched perfectly. The solids help the prints stand out a bit. The quilt is a Disappearing 9 Patch (tutorial here). 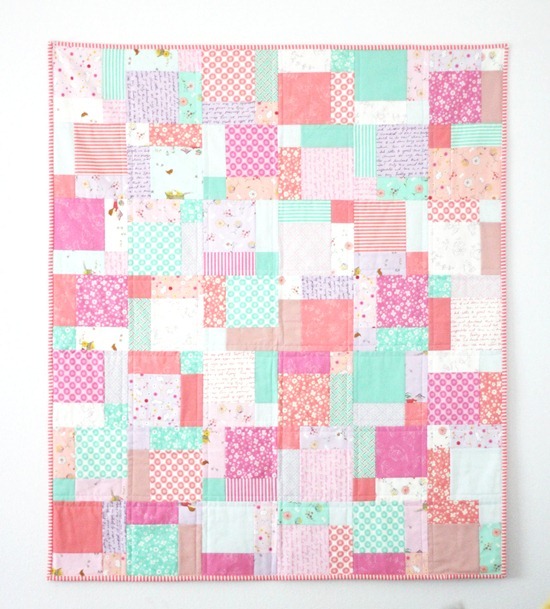 To make a 38″ x 46″ crib quilt like this one you’ll need to start with 99 – 5″ squares. 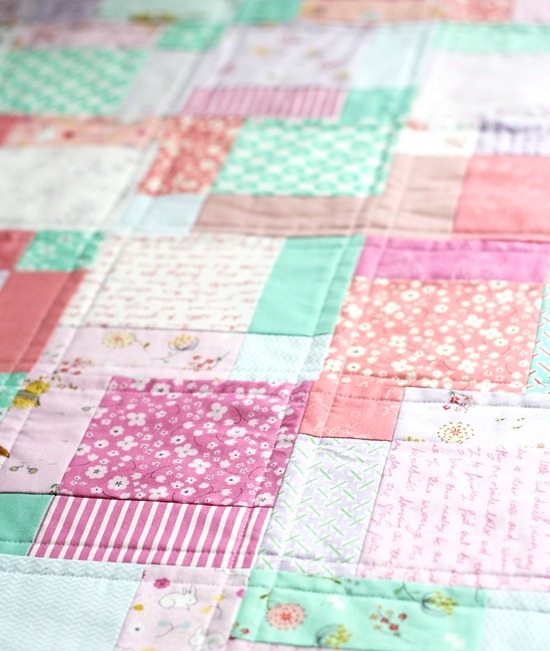 Sew the 5″ squares into 11 – 9 patches. Then after cutting the 9 patches in half each way you’ll use 42 blocks, laid out in 7 rows of 6 blocks each. The backing is this adorable light blue print (the color in the pic is horrible!) and the binding is the coordinating pink stripe from the collection. Just writing this post has me wishing for Spring! Very very sweet quilt. 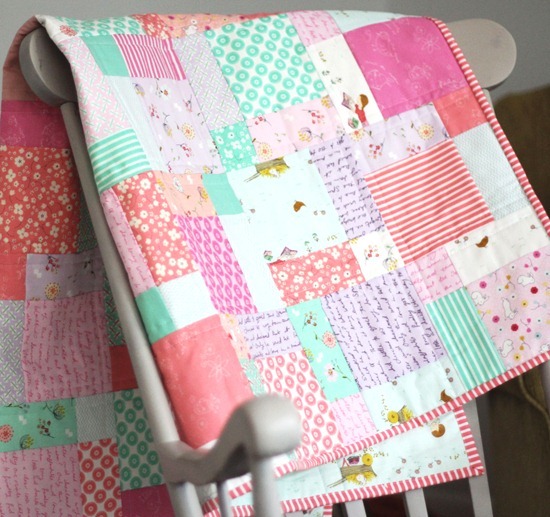 :) Oh how I wish I'd been a quilter when my babies were…..babies! Awesome. I love that fabric too. So pretty. Love the disappearing nine patch. Those little chickens are adorable. Cute! My lilacs have little green buds already. Don't they know it is February!? This is adorable! I am working on a diapering 9 patch quilt right now, and I love how it is turning out. Your fabric choices were great, I love that fabric too!! That is such a great baby quilt and I love the back. Lovely patterns and colours for a baby quilt. Beautiful! I love it! I'm trying to figure out what I want to do with Posy. This is a great idea. Disappearing 9-patch is great with posy! What is that adorable backing fabric? It is perfect for a baby quilt! wonderful quilt. I love the fabric with writing on it. Simply adorable! Such cute prints and colors! Very pretty! Makes me eager for spring to hurry up and get here! So pretty! I absolutely love the backing!!! Very pretty. I am so slow, however. I always look and think, "I really like that". Turns out to be disappearing 9 patch every time! Just found your blog and looooove it. Very fond of squares and their multiple combinations. Surfing over old posts and felling in love with all you'va done so far. My only doubt… isn't it a disappearing 4 patch you are using here? Forget my stupid question. Of course it's disappearing 9 patch. I just want to copy this exactly. It's so sweet. Happy Valentine's Day! I just started seeing this collection everywhere and am completely in love with it! today i find out whether the baby i'm growing is going to be boy or girl and as happy as i would be with either one, i'm so hoping for an excuse to buy a whole lot of this fabric! I didn't care much for Posy till I saw your quilt! Love the border with it. I bought a layer cake of this fabric soon after it came out to use with your Easy Bake pattern that I bought! I picked up a gingham fabric in pink to go along with it but will check out the other fabrics you coordinated with Posy. It's gorgeous – I love the backing print especially. Such a sweet quilt. I love this fabric, too. The colors are retro and modern at the same time! What a cute quilt. I have some fabric sitting waiting to be made into a quilt for my new granddaughter, this disappearing 9 patch may just be the pattern for it. I also love the backing fabric, so sweet! I heart this fabric too. Thank you for adding the other color options. 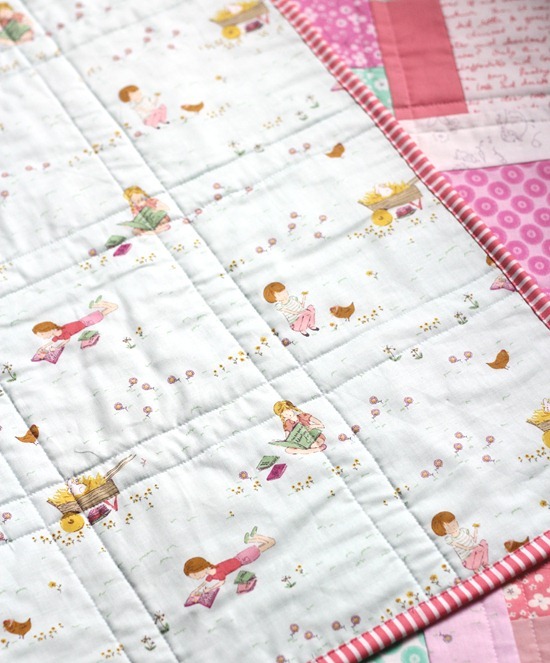 I love this little quilt and the vacling is adorable. What a cutie! I love the fabric and that stripey binding, too. Such a pretty quilt. I love a striped binding. I'm always amazed at how a needle and thread can make most any fabric "go together".